Several Avere OS options, particularly FlashCloud, FlashMove, and FlashMirror, require a separate license. After you purchase a license, you must send your license ID to Avere Global Services, and they will provide you with a license key. An automatic installation feature has recently been added for vFXT licenses; the procedure described here is unnecessary unless the automatic system encounters problems. 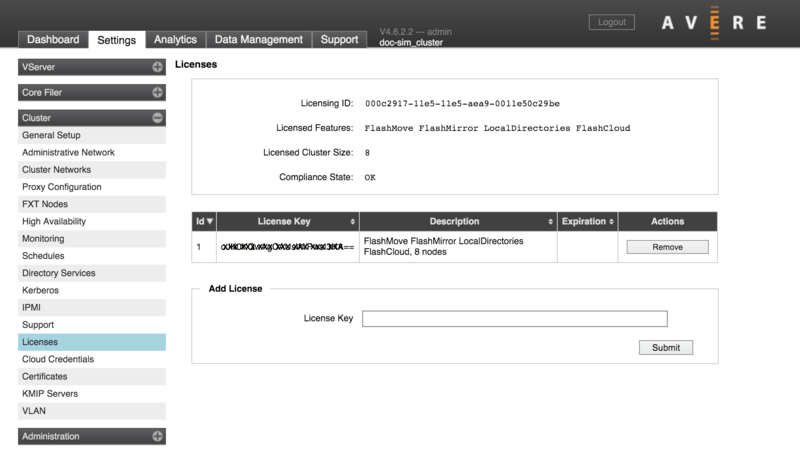 Navigate to the Settings > Cluster > Licenses page. Contact Avere Global Services, and provide the Licensing ID listed at the top of the Licenses page. Enter the license key provided by Avere Global Services in the License Key field. The new license and its associated features appear in the Licenses area. You can also use the Avere Control Panel to remove a license. From the Settings > Cluster > Licenses page, select the Remove button in the row of the license you want to remove. A pop-up window appears asking if you are sure you want to remove the license. Click OK to continue. The license is removed from the list. After removing a FlashMove or FlashMirror license, you will no longer be able to create FlashMove or FlashMirror jobs. Previous jobs still can be viewed from the Data Management tab.